Work was started on 19th March 1882 by Antoni Gaudi. It is yet to be finished (as of May 2017). I think I wanted to paint this because of its historic ‘Spanishness’. Its a representation of the church and the street running along the waterfront. I wanted the floodlit church to dominate its surroundings. If you care to look closer you’ll see people walking about as well as enjoying a meal under a lantern-lit outside eatery. OK. Time to get it out of my system. My self-portrait. Browsing through some of my old photos, I discovered one that was taken when I was ten. A typical school photo showing my ‘tombstone’ teeth and ‘taxi doors’ ears. I wanted to show the passage of the years and let the viewer imagine the times in between. To give the painting a little difference I’ve ‘taped’ me (now) to the wall behind me (then). I got this thing about not letting a painting go. No matter how bad it is or how out of control it’s become. I try to bring it around and be satisfied with it. It doesn’t go in the bin! ‘Up Through The Trees’ wasn’t going right. I was trying to get the feeling of lying on my back and staring up though the trees on a moonlit night. But it wasn’t working. So I put it to one side and carried on with other paintings. There’s always something else to paint. Then a few days ago, after I’d finished ‘Man and Boy’ (above) I fished it out and set about its rescue. The beauty of failure is that things can only get better and you can afford to be bolder. So the broad brush strokes came into play, it was a daub here, a splodge there, with the finishing touch of painting either bright sparks from an unseen campfire or fireflies dancing in the moon. Driving past a ‘cementario’ on my way to Torrevieja, I noticed an old man walking towards its entrance, carrying a bunch of flowers. He was about 70-75, stooped over and walking with the aid of a cane. The word ‘Devotion’ popped into my head and the scene changed slightly to an old man walking down one of the aisles of a cementario, in the pouring rain, carrying a single red rose. Come rain or shine he would take that red rose to his dear departed wife, who may have died many years before. 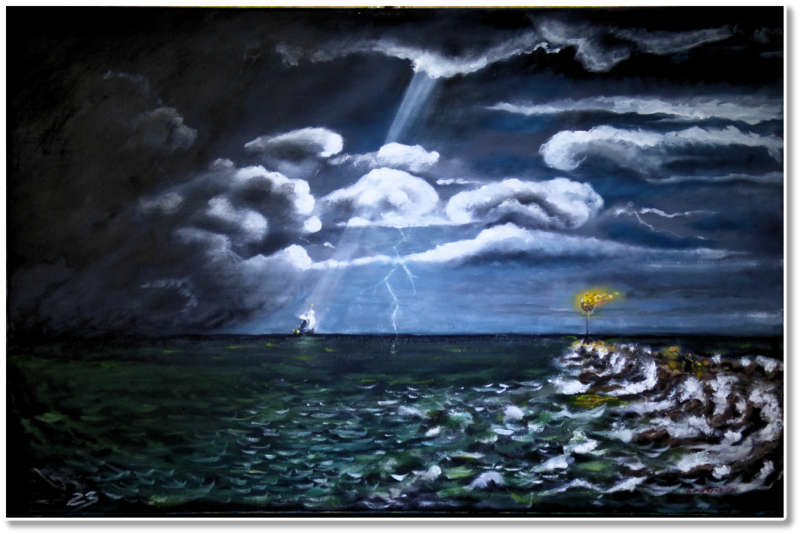 So as my mind ran away with a story of ‘The Light’, it had to be stormy, lightning etc. Someone had to ‘light’ the light so I added a tiny figure of the ‘Lightkeeper’. This painting grew out of the simple desire to hang something ‘cold’ on the wall. Something to look at in the blazing summer months here in Spain and imagine how nice it would be to walk the tree line or dangle my feet in the icy waters. As with a few of my paintings things changed along the way with the addition of the path of the polar bear and the cracked ice. I saw this picture when I was walking though a supermarket in Torrevieja. It was one of a number of repeating pictures showing the clarity of new HD televisions. After my shopping trip I ‘googled’ Lake Bled and found an almost similar picture. The Church on Lake Bled is on an island in Slovenia and there are about ninety steps from the shoreline to reach the church. Conscious of my need to practice water and reflections I took it as a valuable training piece.